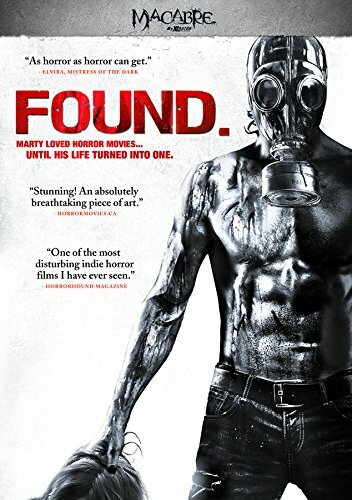 XLrator Media is releasing Found on DVD on September 23, 2014. SYNOPSIS: Marty is the ideal fifth grader. He gets good grades, listens to his teachers, and doesn't start trouble in class. But a darkness is beginning to fall over Marty's life. The kids at school won't stop picking on him, his parents just don't seem to understand him, and now Marty must grapple with a terrible secret that threatens to destroy life as he knows it -- his big brother is a serial killer! Brotherly love is put to the ultimate test in this emotional coming-of-age story that descends into unspeakable horror. Found�is a dark labor of love written by Kentucky author Todd Rigney, shot by an all-Hoosier cast and crew on a micro-budget of just $8,000.� Featuring bold performances by young actors Gavin Brown and Ethan Philbeck, a killer animated title sequence by Indianapolis artist Lowell Isaac, and gut-wrenching gore by the Clockwerk Creature Company,�Found�has been called "as horror as horror can get" by Elvira, Mistress of the Dark.�Found�made its auspicious world premiere in September 2012, when the iconic Elvira and a panel of celebrity judges including Joe Bob Briggs, Bill Moseley, Sybil Danning, and Peaches Christ unanimously selected�Found�for�best feature�at�Elvira's Horror Hunt, sponsored by HorrorHound Magazine and Stan Lee's Comikaze Expo. The film also won awards for best actor and best director. Marty is the ideal fifth grader. He gets good grades, listens to his teachers, and doesn't start trouble in class. But a darkness is beginning to fall over Marty's life. The kids at school won't stop picking on him, his parents just don't seem to understand him, and now Marty must grapple with a terrible secret that threatens to destroy life as he knows it -- his big brother is a serial killer! Brotherly love is put to the ultimate test in this emotional coming-of-age story that descends into unspeakable horror. After reading Todd Rigney's book for the first time, I never wanted anything so badly in my entire life. On a surface level,�Found�struck me as an unlikely mash-up of two of my favorite films ��Ordinary People�and�The Texas Chain Saw Massacre. But under that surface were a dozen or so delicious ambiguities and provocative themes that spoke to me very personally. Chief among these, I think�Found�has a lot to say about bullying and the warping potency of shame in boys' lives. Todd perfectly captures a moment in the life of our young protagonist, Marty � and I think in many boys' lives � where he is forced to make a conscious decision to leave boyhood, to risk alienating his mother and family, just so he can compete and survive among his peers. Boys do this even if it means sacrificing core parts of their humanity. That's what happens when caring gets perceived as a feminine quality, a weakness. And in the depiction of Steve, the older brother, I think we see how dangerous that sacrifice can be. Steve is a projection of Marty further down the road, but he goes beyond violence for retaliation. He embodies an entirely other notion that I've rarely seen explored in media, one that only needs hinted at to shock and disturb � the sexual fetishism of violence. Marty's conflict points to 'nurture'. Steve's suggests 'nature'. Which is more horrifying � that male violence is intrinsic, or that it's bred and condoned?�Found gave me an opportunity to explore the thorny path many boys and young men take as their rite of passage. Todd crystallizes the turning point in Marty's life, and he shows us the worst case scenario in Steve's. The plight of these characters shapes�Found�into a coming-of-age story that descends into full-blown horror. Something I can really sink my teeth into. Todd is a staff writer for WebProNews and contributing blogger for BeyondHollywood.� In Addition to�Found, Todd is also the author of the horror anthology,�Twelve Stories Concerning Love and Death.� At present, he enjoys terrible movies, weird 90's industrial music, and collecting dusty VHS tapes.� He's 34, married, and very pale. Gavin Brown is now fifteen and attends high school in Bloomington, Indiana.� Since making his acting debut in Found, Gavin has been cast in�The Impersonators�and has attended acting class at GJC Talent.� When he's not in school or acting, Gavin enjoys Lacrosse and making music � and hanging out with friends. Ethan Philbeck has performed in many stage productions with the Cardinal Stage Company in Bloomington, Indiana,including�The Grapes of Wrath,�A Christmas Carol,�My Fair Lady,�Annie,�and�If You Give a Mouse a Cookie.� He also donned the role of the Duck in�Click Clack Moo�and worked behind-the-scenes as a co-stage manager for�The Lonesome West�and assistant stage manager for�A Year with Frog and Toad. Phyllis Munro has previously appeared in�Contrition�(2012),Lewis�(2010), and�Babbling Banshee�(2008). � Phyllis participates in Community Theater, both as an actor and a stage manager, and attends acting class at GJC Talent.� She will next be seen in Zack Parker's�Proxy. Louie Lawless has appeared in several Midwest-based film productions, including�Hermetica,�Nothing to Declare,�Don't See It Alone,�My Bloody Wedding,�Tow,�Scorned, andF.L.O.S.T (F*ckload of Scotch Tape).� Passionate about the collaborative nature of film, Louie also participates in Indianapolis' annual 48-Hour Film Project. Read the novel 'Found and Other Stories' available at Amazon.com and wherever books are sold.